For many of us unfortunate to not have been born and bred in France, our first introduction to French cuisine was likely through quirky chef and cookbook author Julia Child, whose life in Paris is thoroughly chronicled in the wonderful book My Life in France. 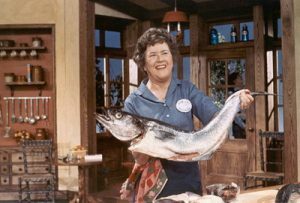 Credited with bringing French food to the non-French masses through her groundbreaking 1961 cookbook Mastering the Art of French Cooking, Child did more toward advancing French gastronomy worldwide than perhaps any other man or woman in the 20th century. And what was Child’s first meal in Paris, one which would become one of her favorite French dishes? Sole meuniere. 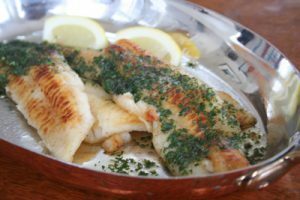 Like many classic French meals, sole meuniere is a rather simple dish: either a whole fish (with gray skin removed) or a fillet, dredged in flour, pan fried in butter, and then served with a brown butter sauce, parsley and lemon. 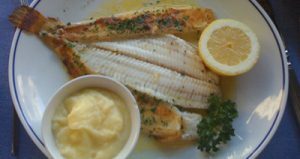 Often, the fish is boned, plated and sauced tableside by the waiter or chef. Yes, that’s it. Simple, right? And nothing like Child’s to-die-for boeuf bourguignon, which has countless steps and seems to take forever to prepare. Yet, Child was simply gaga for it. Perhaps it was the fact that it was her first meal in Paris, and that it set the tone for her ensuing love of the City of Light and of French food. Perhaps she had never tasted anything like in growing up in humdrum Pasadena, Calif. Perhaps it was because a simple dish perfectly prepared is often better than even the most elaborate concoction. But had Child been introduced to Parisian cuisine with a bland, mediocre, poorly prepared entree, she might never have developed her love of cooking or been inspired to introduce mid-20th century American housewives to the joys of French cuisine. All from a humble, simple fish dish. This entry was posted in Books, Food, French cuisine and tagged Julia Child, Mastering the Art of French Cooking, My Life in France, sole meuniere by Bob Adams. Bookmark the permalink.